When plant species disappear due to climate change, this may lead to the subsequent loss of various animal species. Insects which depend on interactions with specific plant partners are particularly threatened. Plants, in contrast, will be less sensitive to the disappearance of their animal partners, according to an international team led by scientists from Senckenberg. Their study was published recently in the scientific journal Nature Communications. One plant species that will be negatively affected by climate change is the harebell. 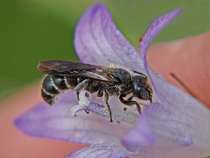 It is an essential food source for a specialized species of leaf-cutter bee, Chelostoma rapunculi. Like all animal and plant species both are part of complex ecological networks, in which interacting species are interlinked. "The local extinction of animals and plants can lead to a chain reaction of other extinction events in these networks, e.g., as a result of climate change," says Dr. Matthias Schleuning of the Senckenberg Biodiversity and Climate Research Centre. Together with his colleagues, he modeled the vulnerability of more than 700 European plant and animal species to future climate change. For the first time, they combined these models with data on interactions of plants with their animal pollinators and seed dispersers. The simulation indicates that the initial spark for extinction cascades as a result of climate change mostly originates from plant species and is indirectly transferred to animal species. This domino effect is a particular threat to animal species that only interact with a small number of plant species, since they are more sensitive to climate change than generalists. "In the future, these specialists will therefore face a double threat. According to our analyses, they are restricted to a narrow climatic niche and are therefore also directly threatened by rising temperatures in the future," explains Dr. Christian Hof, Senckenberg Biodiversity and Climate Research Centre. 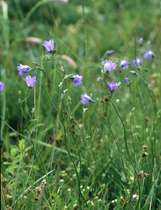 "Chelostoma rapunculi is, thus, threatened directly, due to climate change, as well as indirectly, due to the disappearance of important food plants such as the harebell," according to co-author Dr. Jochen Fründ of the University of Freiburg. In contrast, the researchers detected only minor feedbacks from animals to plants, since animal species that are particularly affected by climate change usually interacted with a small number of plant species. "For instance, the harebell is visited by many different pollinators; it can therefore be expected that it will not be significantly affected by the loss of a few specialized pollinators," adds Fründ. Animals such as Chelostoma rapunculi could escape their fate only if they reallocate many interactions to new plant partners in the future. So far, however, the animals' potential for this type of rewiring is not well understood. Animals that closely depend on certain plant species during their entire life cycle appear to be particularly threatened. Therefore, insects will face a higher threat than many bird species, which tend to be more flexible in their food choice. "Our study shows that climate change not only poses a direct threat to many animal species, but that additional indirect effects also play a role. Therefore, climate change may have a more negative effect on the biological diversity of animals than previously assumed," says Schleuning, and he adds, "A consideration of biotic interactions between animals and plants is therefore important for predicting the impacts of climate change on biodiversity."